What happens when over 200 artists, painters, dancers, musicians, sculptors, fashion designers, and photographers come together in what has become a yearly festival of art? Throw in the angle of celebrating Uganda’s 50 years of independence and what do you have? A blazing hub of activity, color competition for the eyes, music for the ears, perplexity and appreciation for the mind, and inspiration for the heart as array upon array of art in every form and expression takes you on a whirlwind journey to places you had never before imagined. Bruno Ruganzu released the child in us with his creation of a still airplane that acted as a playground for the children at the festival. Using hard plastic on the inside and wheels for movement, children sat in and played to their heart’s content. 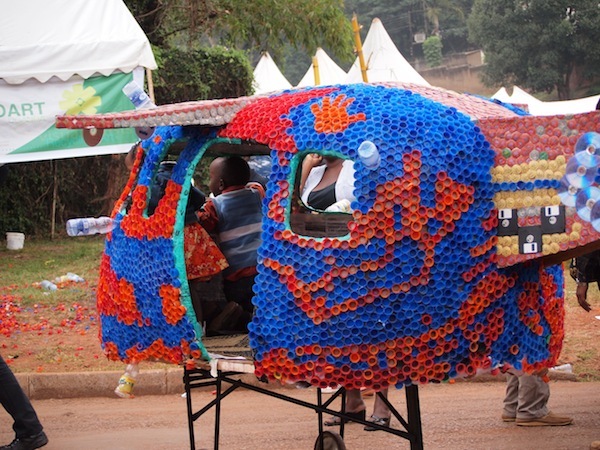 His artistry was revealed in layering its outside with Fanta and mineral water bottle tops; giving the plane an orange and bluish appearance. The beautiful thing about the LaBa! is that there is always something happening at either the end of the street, its middle or the field nearby. So much that even though there was a match at Namboole between the Uganda Cranes and Senegal, the turn up was good. Towards twilight, when I heard loud cheers in the middle of the art market, I thought the Uganda Cranes had scored, only to reach the tent and find that the people who had gathered at the Breakdance Project Uganda tent were cheering the dancers on. They had formed a circle, and one by one they emerged to outdo each other on who had the best dance moves, hence the loud noise. They did back flips, twirled their torsos upwards and flung their legs in the air to the pleasure of onlookers. The project is a grassroots youth-centered organization founded in 2006 that uses breakdance as a tool to engage and unite young people and train them to become socially responsible leaders in the community. For now they helped to liven up the festival and give it that youthful gusto. The festival attracted people from all walks of life. The young and the old. Tourists and art lovers. Business people and students. Mackinnon road between the crossroads with Kafu and Sezibwa teamed with vibrancy and agility. Fairway being just next to Goethe-Zentrum utilized this chance to exhibit as well. Using the ground below its back fence, their amazing gallery of colorful unique art pieces was put on display. The lowest piece was at $500. The pieces were good, I agreed, but even I couldn’t help cringing at the prices. 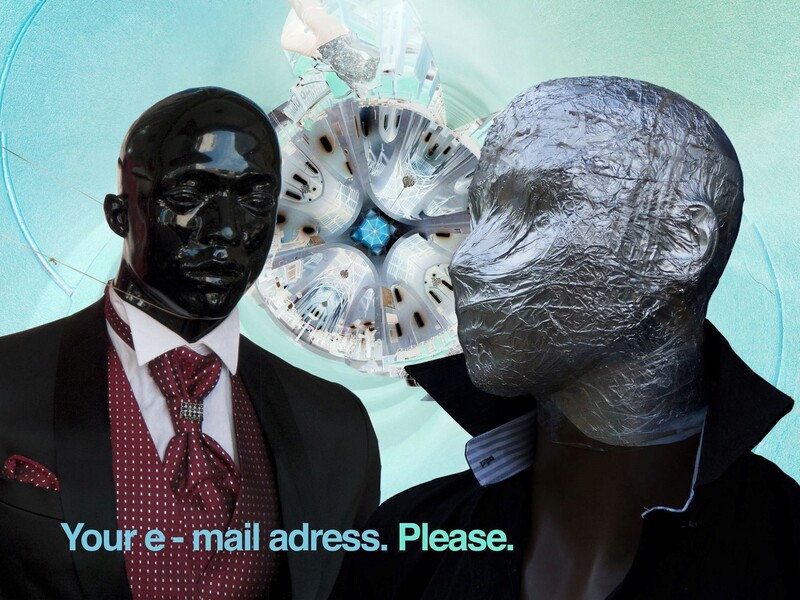 Visual artists Henry Mzili and Daudi Karungi, founders of Startjournal.org, questioning Art and exclusivity at LaBa! 2012. 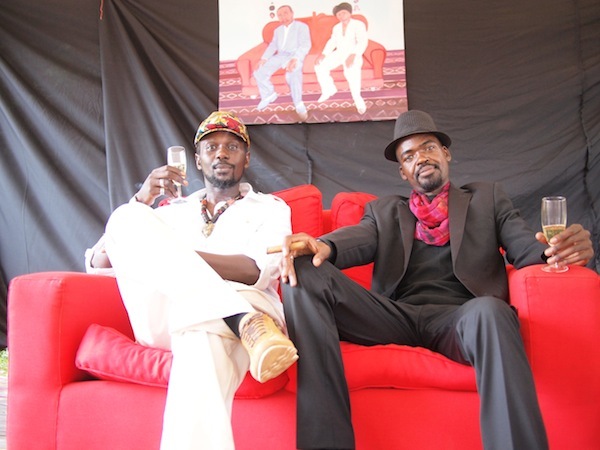 Anwar Sadat, the founder and Director of Karibu Art Studio, was another of the participating artists. He released his inner feelings and outside inspirations directly from nature, onto canvas using various kinds of creative material. What struck the eye while looking at his work was the rough surface each piece exhibited. He said it is his distinctive mark and stamp for every piece made. Bright colors are another of his trademarks; yellow, blue, orange are his favorites. Bead World lured my eyes away from other tents, for whereas most painters relied on water and oil, Komumbabazi Caroline painted with beads and the result was sophisticated nudes on canvas. Her beadwork extended as well to pieces with utility value like bracelets, earrings, necklaces, wall hangings and table mats. Abdee Kinyenya and Astrid Dill tasked our minds as he portrayed different faces as one. Someone’s eye added with another’s, a man and woman’s hair all on one head! “It is my way of creating art using the imagination,” he explained. Creating beautiful jewelry and apparel was the signature mark of 4Africa. An organization that is helping women help themselves through creating products that caters to the tastes of the African as well as European markets. Their products included necklaces, bracelets, and scarves. The African Kitengi in different prints and other jewellery accessories from recycled and natural material were all on exhibit. This year’s theme, according to Goethe-Zentrum director, Carolin Christgau, was liberation, arts, participation. This saw art lovers engage themselves in strengthening the community of Kampala by transforming 50 dustbins into pieces of art. The dustbins were meant to be distributed in Kampala—as a symbol of how art and participation can transform a society. After the art markets had closed and the sidewalks deserted, all guests convened in the gardens of the Goethe-Zentrum, where they were entertained with music, fashion and poetry featuring acts like Abrams, Irene Ntale and Ife Phianki. Latif did what has become a ritual, designing clothes on set and timing himself while at it and dressing the models on stage as well. Stella Atal, Anna Clare Lukoma and Ras Kasozi also showcased, but there was nothing that we hadn’t seen before. Earlier we had been told they would design guests’ choice of clothes, but that didn’t happen. Instead a black runway beside the stage was set up and the models strutted their stuff for the brief minutes they were given. 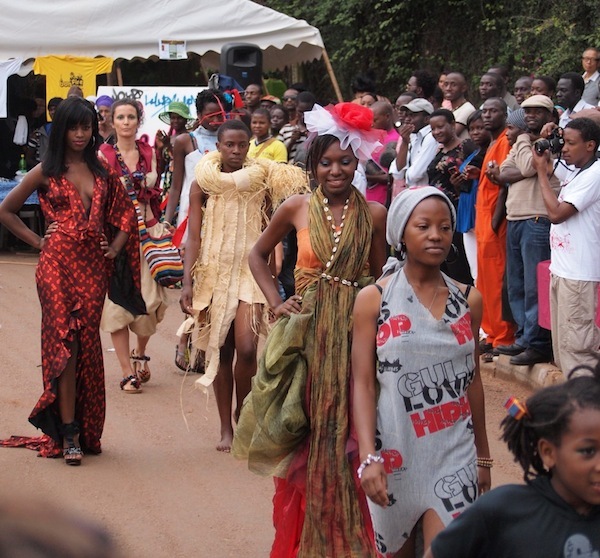 Ugandan Fashion designers showcasing at LaBa! 2012. LaBa! Started in 2007 with the slogan Pot in the hole—a tribute to the numerous potholes on Bukoto Street. Also this year, artists and spectators were both invited to transform concrete into art; playfully, artistically and colorfully and the result was a Mackinnon road turned into an open-air platform for creativity. Coca Cola, WBS, Alliance Française, Radio Simba, the Germany Embassy, DMark Mobile, and the Royal Norwegian Embassy were some of the official sponsors of this 6th edition of the LaBa! Street Art Festival.